When the weather getting cold, don’t you just want to eat some warm soup with your own cozy situation? I do! 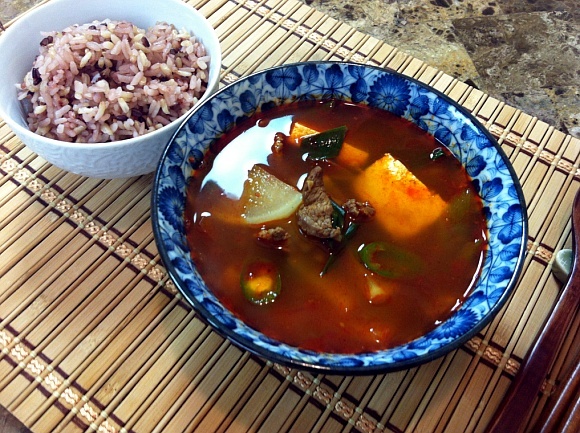 ♥ I love this Korean spicy beef radish soup because it is so easy, simple and fast to make. And of course, lots of flavor as usual as all Asian food! Heat a large pot over low heat; add sesame oil and next 3 ingredients. Combine well and infuse the flavors to the oil for 3 to 5 minutes. Increase heat to high; add beef and season with pinch of salt and pepper. Stir-fry for a couple minutes then add water. Bring to boil then add radish, bring to boil again. Season with fish sauce, hard boil for 5 minutes. Add chili, tofu and more salt and pepper for your taste. Bring back to boil then remove from heat. 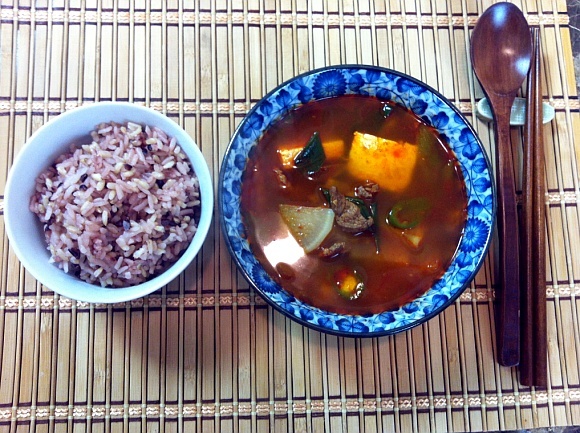 Serve warm, with warm rice if you would love to. Vacation #6. The Last Day in Vegas. Vacation #7. Mom, mom, mommy, mama, Umma(엄마)!! !